I remember one of the first videos I saw of Julia Child cooking something. She was making a sauce to go on top of something and using sour cream. And she said, "Now just take a nice big plop of the sour cream and mix it in there." Or something very close to that. I just especially remember the big plop of sour cream. I nearly laughed my pants off and fell in love with Julia's style right then. (As someone who has written on recipes, "add a small plop" of this or that.) I have never been able to find that particular video again, but I'll never forget it. So the BreadBakingBabes invited the Buddies to post with them this month in honor of Julia's birthday. Despite there not being a day under 80 here for the past couple weeks, I managed to not raise my french bread too fast my multiple stints in the fridge, including an overnight. It only adds to the flavor fortunately. Since we don't have access to french flour here, which has lower gluten than American all purpose, I used a small portion of whole wheat pastry flour with the bran sifted out to try and relax my dough a bit. It was very nice to work with, not so stubborn while shaping as it could have been. I really enjoyed the shaping process. Very easy. 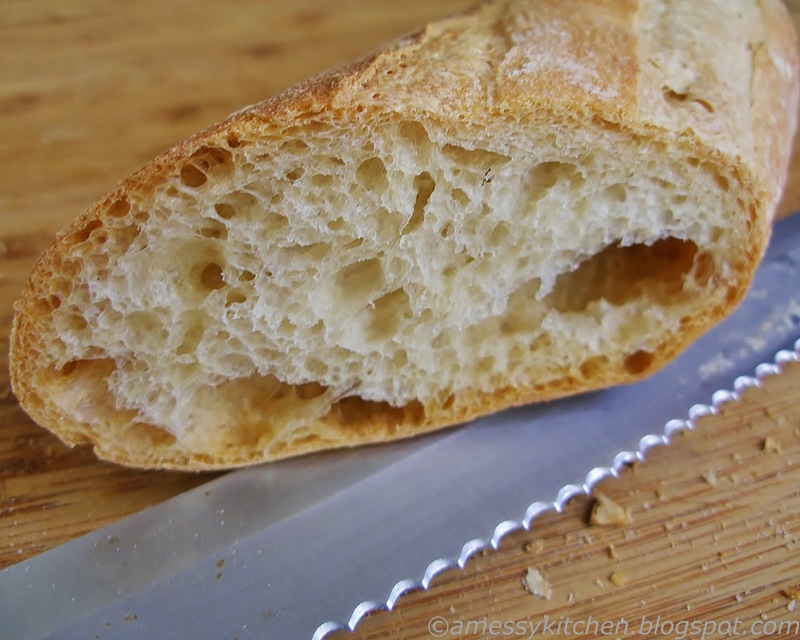 And oh wow, that wonderful crackly sound while the baguettes were cooling. I'm pretty proud since I did the whole thing by hand and I do usually use a machine to do some of my kneading. Here is the handy recipe summary that Susan of Wild Yeast provided. I used the instant yeast option this time, but I'd love to try it again with fresh yeast - something I have never used before. Turn the dough onto a kneading surface and let rest for 2 - 3 minutes while you wash and dry the bowl. Knead the dough for 5 - 10 minutes. See the original recipe for details on Julia's kneading technique [p. 59]. Let the dough rest for 3 - 4 minutes, then knead again for a minute. The surface should be smooth and the dough will be soft and somewhat sticky. Let the dough rise at room temperature until not quite tripled in volume, about 1 1/2 - 2 hours. 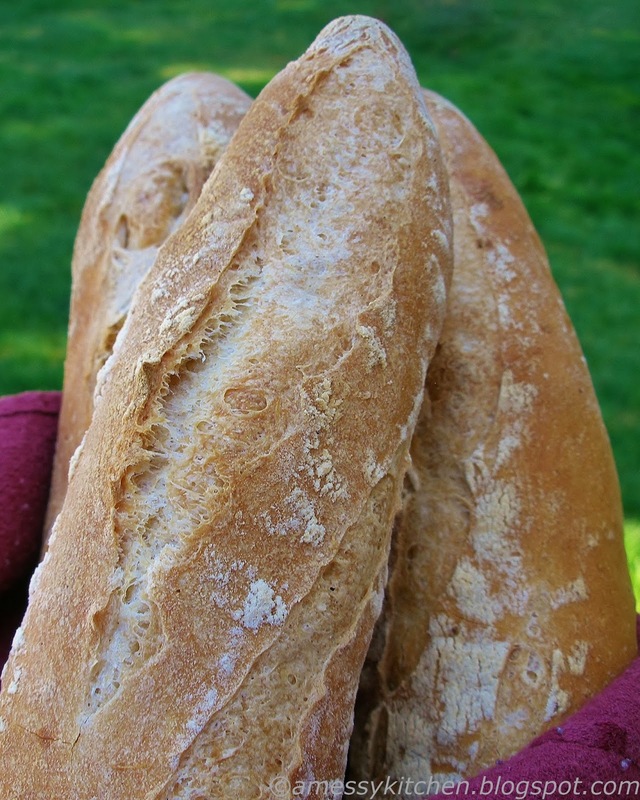 Cover the loaves loosely and let them rise at room temperature until almost triple in volume, about 1 1/2 - 2 1/2 hours. Meanwhile, Preheat oven to 450F. Set up your "simulated baker's oven" [p. 70] if you will use one. Using an "unmolding board," transfer the risen loaves onto a baking sheet [p.65] or peel [p. 72]. Steam with the "steam contraption" [p. 71 and 72] or by spraying three times at 3-minute intervals. Cool for 2 - 3 hours. Julia deserves to be Yeastspotted! Thanks so much for helping celebrate Julia's birthday and baking with the BBBs. Lol, sorry, no, you can keep your triple digit temps! Averaging in the mid 80s is quite more than enough for me and the next two days are slated to be in the 90s. We have a "excessive heat watch" through Saturday. I'm a heat pansy and I love living in the northwest. ☺ I wish I would have recorded the crackle sound now you mention it. I can't remember it happening before except maybe Susan's overnight ciabatta. Guess I just need to try again and again! You got the singing bread! That's probably the most rewarding sound in the kitchen, love that. Your crust and crumb look great. Thanks for baking with us! 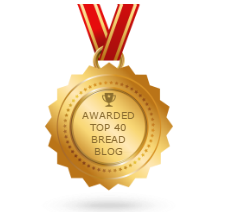 Amazing looking bread, you nailed this recipe totally!! Many thanks for baking with us, especially because it was so hot. I hope the heat breaks soon. It was revolting here for days but is absolutely blissful now: 23C and hardly any humidity. Yay! I love French bread. Yours looks like it turned out very nicely. What lovely loaves of fresh French bread. They look beautiful and I bet they were delicious! I stumbled onto your blog, as I was searching for Pomona's Pectin. Nice! I've got some perusing to do, especially since I want to make your homemade marshmallow fluff and this bread. I'll be back! A singing crust, you did Julia proud! Thanks for baking with us to celebrate her! Your weather sounds heavenly to me! Not a day under 80 is practically WINTER weather for this girl. We just this week dipped under 110 for the first time in at least ten days. Blech. I'm soooo ready for fall! That bread looks incredible. You absolutely rocked this recipe. Way to go!